Hello Unboxers! Join us today for an honest DreamCloud mattress review. Dreamcloud is a hybrid mattress which means it has memory foam and springs. The top is a European pillow top style mattress with high end cashmere cover and tufting we don’t usually see in a boxed mattress. It really comes in a very large, durable bag. They offer a white glove service and will set up your mattress for you in your home. To be honest, DreamCloud makes other mattresses in a box seem boring by comparison. There’s just a lot more going on with this mattress, so let’s get into the details. We’re reviewing the queen size DreamCloud, which was given to us for the purpose of this review. We’re affiliates of DreamCloud. 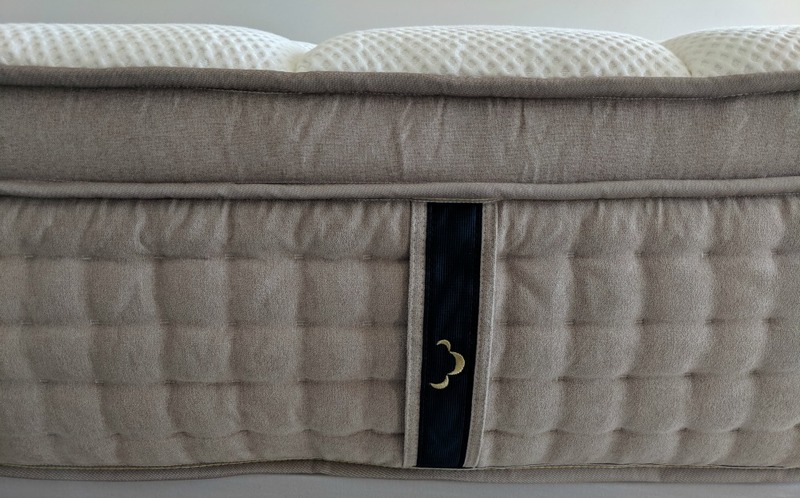 This is the only mattress we’ve reviewed that has handles on the side! We know how tough it can be to decide on an online mattress that you’ll love. This customer tried Purple mattress twice! But in the end she found and stuck with Dreamcloud. Got ours delivered and set up yesterday. So far it’s great! My hubby has back issues and we have gone through every mattress imaginable, from Tempurpedic to Purple. We had bought a Stearns Fosters and liked the firmness and the coils for support but not the huge price tag and the big buttons we could feel through several layers. This is our 11th mattress in the last 2 years….ELEVEN!! The last one we purchased was a Christelli mattress and it started having issues after 6mos but because they only have a 60 day trial period we are now out $2500. Looking forward to seeing how this mattress hold up over this next year. When you hear the word cloud you think soft but the DreamCloud will only be your dream mattress if you like your bed on the firm end. In fact, it’s the most firm bed in a box mattress we’ve tested so far. Honestly, we thought DreamCloud would be too soft. We usually steer away from a memory foam mattress for that reason. However, it’s actually more firm than expected. The mattress does warm up to your body, but not a lot. So if you sleep warm you can rest easy with this mattress. The Dreamcloud mattress doesn’t actually come in a box, it comes in a double layer of bags. Yes, that’s right it’s boxless! It arrived in great condition and delivery was fast. It weighs 94 lbs. The mattress was rolled up in layers of plastic and well protected. Everything about it spoke to its quality. Dreamcloud offers a lease-to-own finance option if you are unable to pay in full which is helpful. You can’t beat the sleep trial or warranty on this mattress! When you think of clouds, think eternity because it will be free from defects in workmanship and materials for as long as you own and use the mattress. For the first 10 years of ownership, they will replace your mattress with a brand new DreamCloud at absolutely no charge to you if defective in workmanship and materials. In years 10+ they will completely repair and re-cover your DreamCloud, or replace your DreamCloud and all transportation charges will be waived if a manufacturing defect(s) or a materials failure is confirmed to exist. You get a full year sleep trial on this bed. That means you can get a full refund, no shipping or fees, if you change your mind in the first YEAR. Did you know Mattress Firm gives you 30 days trial on their mattresses and charges you almost $80 for a return? That’s why we love that you get plenty of time to decide what you think. Plus you’re not out anything if you don’t keep it. READ Are Mattresses Shipped in a Box As High Quality as Other Mattresses? Dreamcloud comes with a 20 year guarantee, which is also generous. While you may never need it, the warranty and sleep trial, helps give you peace of mind that you’ll be happy your purchase. Some people mention a terrible smell and odor once it’s open, but it really wasn’t that terrible. There wasn’t a strong offgassing. Mattresses from the same brand may have more or less new bed smell to them depending on the manufacturing process and how long they aired out before being wrapped in plastic. So your bed may be different than someone else’s. Dreamcloud is CertiPUR-US® approved. These foams are made without ozone depleters, PBDE flame retardants, mercury, lead and other heavy metals, formaldehyde, phthalates regulated by the Consumer Product Safety Commission. They are Low VOC (Volatile Organic Compound) emissions for indoor air quality (less than 0.5 parts per million). Dreamcloud has 8 layers which isn’t as many as some other luxury brands but it has higher end detailing and a cashmere cover. This is the dreamiest part of the mattress. Their Cashmere cover provides breathability, adds premium softness and is naturally resistant to bedbugs. Contouring support that conforms to your body but won’t leave you stuck and overheating. DreamCloud’s gel infused foam is cooling and supportive. They say it’s soft but we already covered that! Luxurious high-density memory foam provides deep contouring support and the best of all possible dreamworlds. DreamCloud’s Super dense foam keeps your back in alignment and cradles your spine no matter what sleep position you prefer. You need a platform, adjustable base or metal frame to put your new DreamCloud on. As with the other boxed mattresses it doesn’t come with box springs, only the top mattress. When you use our link you help support our small business. Thank you!